« Ronald Westcott: Arsenal’s unluckiest player ever of whom we know so little. Arsenal’s forgotten manager Joe Shaw wins the league for Arsenal. 28 April 1934. Joseph Ebenezer Shaw – a name to conjure with, although in reality he was known as Joe Shaw. Joe Shaw was born May 7, 1883 (Arsenal, the football facts has 1882) and died in September 1963 aged 80 after a lifetime of service to Arsenal. He is one of the handful of men who need a plaque of remembrance in the club’s precincts. Joe Shaw started out with Bury, where he was born, and then moved on to Accrington Stanley, before reaching Plumstead in 1907. It is worth noting in passing that while Accrington are remembered as founders of the original football league they resigned in 1893, and that this time were in non-league football (they returned in 1921). Bury however were a first division club who had come 5th as recently as 1901. When Shaw came Jimmy Sharp was the left back regular and in his first season he made a couple of appearances when Sharp was injured – his first against Preston on September 28 1907 (losing 0-3 away). But from the start of the following season Joe Shaw was the first choice, playing between 28 and 38 games a season until 1921 – moving to right back after the War. By the 1921-22 season he was 37, but still he started out in the side, playing the first two games, but age took its toll then only managed six more, ending in a 1-0 defeat away to Manchester United on March 11, 1922, a couple of months short of his 38th birthday. Thus Joe Shaw was a player who joined the club in the First Division, was there with the relegation, moved to Highbury, and was there for the return to the top league in 1919 – when he was made captain. He would have played many more games and possibly held our record number of appearances, had it not been for the four war years when no official football was played. When he finished playing for Arsenal (after 326 games including the FA Cup matches) he became manager of Arsenal Reserves, and upon the death of Herbert Chapman he took over the first team for the rest of the season. When George Allison came along he went back to the reserves. Not exactly Pat Rice (full back, temporary manager before Wenger), but not far off. I have for some time petitioned Arsenal to put up a plaque to him, but so far without luck. But I do remind them of the idea occasionally. After all, we had some success with the statues. However I now want to go back to Joe Shaw’s greatest triumph. When Herbert Chapman died Joe Shaw was made manager for the rest of the season with the clear understanding that the liaison between Joe and the board would be George Allison. Arsenal were now once more equal on points with Huddersfield and 0.03 goals behind. There was in effect still just one goal in it. All that was needed was for the new signing Ted Drake to get going. Certainly recent form was with Arsenal. Arsenal weren’t scoring huge numbers of goals (three twice, two twice, and one four times) but they were getting the points. But as was noted at the time, with the exception of a game against Derby they had not had to face any of the top teams for a while. This was all about to change as on 2 April Arsenal had to play the return match with Derby, and on 7 April they were due to play Huddersfield – two matches which it was felt could well determine the outcome of the season. As the table above shows, by the start of the month Derby had slipped back to fourth having won just one of the last nine and in fact won 2 of the last 15, having won 10 in 12 earlier in the season. Arsenal’s victory by 4-2 confirmed the current form – Derby were now seen to have no chance of the league. So far Drake had played three following his transfer from Southampton, and scored just one, but reports said he was looking the part and bound to score soon – and indeed he now started with two goals; Bowden getting the other two. The same day Tottenham, also with an away fixture, lost 2-0 at Stoke. The feeling was confirmed that it was now all down to Arsenal and Huddersfield. Huddersfield didn’t play on 2 April (Easter Monday) but instead had a home game against lowly Liverpool on the Tuesday, 3 April. The teams had met on 30 March at Anfield and drawn 2-2 – itself something of a surprise since Liverpool had lost their previous match 5-1 away to Leeds United. But they had recovered and on the last day of March they had had a home victory over Derby 4-2. However it was away from home that Liverpool had real trouble, for they had won just two, drawn three and lost 13 games. Huddersfield at home had won 13, drawn three and lost just one. If ever there was a home banker (as the pools firms liked to call it) this surely was it. And yet, unbelievably it ended second placed Huddersfield Town 0, 19th placed Liverpool 2. It was one of the great upsets of the season. Before the game the top of the table saw Arsenal top by two points, but with a goal average just one hundreth of a goal better than Huddersfield. The result not only secured Arsenal’s position at the top but dented Huddersfield’s goal difference as well. Meanwhile, away from football, in one of those events which of course was not noticed at the time, but which has affected everyone who has been on a public road, on 3 April Percy Shaw patented the cat’s eye road-safety device for the middle of (and later the side of) roads – with lights that shine back when car headlights point at them. He had started work as a labourer in a cloth mill at the age of 13 and got the OBE in 1965. It was the blackout in the second world war which finally gave the biggest boost to production and made the whole process a worldwide success. Back with the football, the results above set up what was seen as the championship decider: Arsenal v Huddersfield Town on 7 April 1934. A win for Arsenal would leave Huddersfield four points behind, and with a further dent in their goal average. A win for Huddersfield by just one goal to nil would lift them back to the top on goal average by a different of 0.004 goals. But Huddersfield had now had just one win one defeat and one draw in last three matches. OK for a mid-table club but no way to win the league. Their away form was better than average (six wins, seven draws, five defeats, as they still played on the counter attacking system introduced by Chapman) but it all gave Arsenal some hope. For the first time since February Arsenal had Chapman’s first choice defence for the season back in place: Moss, Male, Roberts, Hapgood, Hill, John, and a certain belief came back into the team. Drake scored again, which gave a positive feel up front. Beasley and Bowden got two more and so the result on 7 April 1934 was Arsenal 3 Huddersfield Town 1. 55,930 packed Highbury to see Shaw’s team take a major step to the second consecutive league title. Meanwhile in other news (as they say) and by a curious coincidence, the other two members of the top four played each other and the result was Derby 4 Tottenham 3. This meant that leading up to the next match on 14 April Arsenal were the absolute team in form with five wins and one defeat in the last six. Huddersfield and Tottenham had just lost their last two games, while Derby had two wins, three defeats and a draw in the last six. Further Arsenal and Huddersfield still had five games to play. Tottenham with just three to play were now mathematically incapable of catching Arsenal. April 14 was one of those crazy days that existed in the football calendar at this time in which international matches were held just as clubs were trying to win the league or avoid relegation. This meant that Frank Moss (making his international debut), Eddie Hapgood and Cliff Bastin were all out of the team. Indeed Cliff Bastin scored for England against Scotland, six years after playing his first game ever – for Exeter Reserves against Bath City. But Arsenal had prepared for this moment – everyone was ready to step up and take their chance. Incidentally also on 14 April 1934 Arsenal Reserves played Watford Reserves, a match which was advertised as “Admission 7d (including tax).” That was less than half a penny in 2017 prices and money. Clearly Huddersfield could reach a total of 58 points from their remaining games. Arsenal thus needed two wins and a draw from their remaining four matches to be utterly certain of the title. The first chance to get these needed results came on Wednesday 18 April, when Portsmouth v Arsenal was the only first division match on the sporting calendar. And to everyone’s surprise Arsenal lost 1-0. The team was that which had won the Liverpool game, plus the missing international players now returned to their club. Portsmouth had just suffered five successive defeats, followed by a 2-0 win over Blackburn at home. They were 15th before the game with a fairly decent home record of nine wins, five draws and five defeats. For Arsenal it just all went wrong on the day. Although now irrelevant to the league title’s destination, Derby lost again the following day 2-0 away to Leicester, to confirm their continuing decline. Thus everything was set for Saturday 21 April. Arsenal were at home to Sunderland, Huddersfield away to Middlesbrough. With Middlesbrough in 17th place it was clear that Arsenal had the tougher of the two games even though they had home advantage. Huddersfield had the game in hand, but still were dependent on Arsenal slipping up. They had just done so at Portsmouth, but Huddersfield needed it to happen again. Drake and Beasley got the Arsenal goals. Drake was not scoring in every game, that was true, but now having played eight he had scored five – not bad for a player coming in at such a tense moment at the end of the season. As for this day, it was in short a sensational set of results from Arsenal’s point of view and left everyone in no doubt where the championship was going. Huddersfield now needed to win all three remaining games, while Arsenal had to lose their last two matches. The goal average was close enough to mean that in such circumstances Huddersfield probably would have enough of a goal improvement to take the title – but even then it was not certain. After that loss to Middlesbrough no one outside Huddersfield believed it possible. On 25 April Huddersfield kept their faint hopes alive with a 1-0 win over Everton. Their game on Saturday 28 April was against fifth placed Blackburn. Arsenal simply needed a draw against 19th placed Chelsea to secure the title. Chelsea, although in their customary lowly position, did have a decent home record having won 12 drawn two and lost six. 65344 turned up for the game and at half time Arsenal were 1-0 up through a goal from Alex James. Although Chelsea got two in the second half, Bastin scored again for Arsenal and the draw was secured. With one game to spare it was enough to give Joe Shaw the championship and make it two titles in a row for Arsenal. It was also Charlie Jones last game for the club. Huddersfield beat Blackburn 5-3, but for them it was all over. There was one game left for both Huddersfield and Arsenal played out on 5 May. Arsenal beat Sheffield United 2-0 while Huddersfield beat Birmingham City away 3-1. Extraordinarily, as it would seem to us today, the notion of celebrating Arsenal’s second successive triumph, the notion of Joe Shaw, the most unlikely league winning manager in the history of the club, and the notion of honouring Herbert Chapman one more time, seemed lost on the crowd. Only 25,265 turned up for the final game. In that match nine of Chapman’s selected team for the first match of the season played. The two additions were Beasley, whom Chapman signed and Drake, who he had chased so hard, but who was finally signed by Allison, on Shaw’s behalf. Fittingly as a look back to the past and on to the future Drake scored both goals. It gave him seven goals in the ten final games of the season that he had played for Arsenal, and was beyond any doubt a significant part of Arsenal’s triumph. Here is a table summarising the April and May games. It was, to my mind, the most momentous season in Arsenal’s history. That Chapman could die just four days after he seemed perfectly well seems to us today incomprehensible. That Joe Shaw, one of the all-time great servants of the club should be the manager who could take over and take the team to the championship seems beyond belief within the context of his life both before this event, and indeed after, as he returned (seemingly very happily) to be reserve team manager. To me the season reads like a story book, a sort of Roy of the Rovers event, and the tragedy of it all is not just that the season is hardly understood by many supporters, but that the club itself does not recognise the work of Joe Shaw. This is why I have campaigned (without any success I must admit) for a memorial to Chapman, Shaw, Allison and Whittaker – the four men who worked together in 1925 and continued the success of the club into the post-war era. Arsenal played 23 league games under Joe Shaw and had a win rate of 60.87%, the highest of any Arsenal manager who controlled the club for over 20 matches. He played in the club’s first two FA Cup semi-finals and was an ever-present in the Arsenal side in second season at Highbury. He was club captain in the post-war era and as noted became just the third player to play over 300 league games for the club. He continued at Arsenal up to, and through, the second word war, and although he then took over at Chelsea for a short while he returned to Arsenal and became assistant manager to Tom Whittaker. Joe retired from football in 1956 and died in 1963 at the age of 80. He deserves a fulsome recognition at the Emirates Stadium. The full story of Arsenal in the 1930s is told in our series of that name. Every match, including cup games and friendlies, is included, and there are separate articles on most of the players – those still missing are being added regularly. You can find the index to all the articles on Arsenal’s most incredible decade at Arsenal in the 30s. 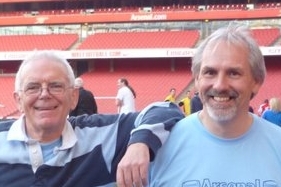 There is an index to all the other series on the site on the home page of Arsenal History Society. 3 comments to Arsenal’s forgotten manager Joe Shaw wins the league for Arsenal. 28 April 1934. I am a dedicated follower of AFC but never knew that Arthur Manager was the manager in the year that Chapman died. Happy to help him receive his proper appreciation – even if posthumously. I would like Joe Shaw to have some kind of memorial. He was my great uncle, my maternal grandfather was his younger brother, Walter. Unfortunately I have nothing of his, although he came to our house several times. We, my sisters and I, we’re not aware of his success at the time. Keep up the good work. Thank you. I have proposed to Arsenal that there should be a memorial to the four great managers of the era – Chapman, Shaw, Allison and Whittaker, at the ground, and although the club has acknowledged the idea nothing has come of it. I am hoping to be able to put the idea to the club again in the near future. Thank you so much for getting in touch.